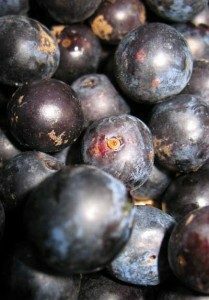 When the sloes are big and juicy, they are ripe for picking. Choose a dry day and fill a basket! 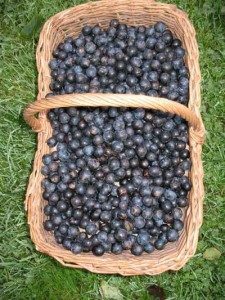 The sloe jelly is a wonderful dark purple colour and a great jelly to serve with game, particularly hare. We won first prize in the local produce show with a jar of this sloe jelly! pour mixture from pan through a jelly bag or equivalent sieve & leave over night to drip. Do not push anything through – just rely on the drip. rebottle, and store until the following Christmas! We ate the sloes left in the jelly bag for pudding – mixed with a little apple jelly and lots of yoghurt. The sloes strained from the gin are excellent when cooked in a special bread and butter pudding. These 2 recipes for sloes are easy, but rewarding!